Spayghetti & No Balls Dinner Benefit is this Saturday February 24th! 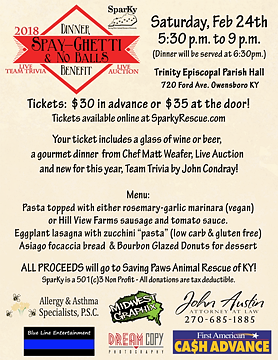 Join us for our second annual Spay-Ghetti & No Balls Dinner Benefit for Saving Paws Animal Rescue of Kentucky. This year our dinner will be prepared by Chef Matt Weafer. This year we have added Trivia with John Condray! Your ticket includes a glass of wine or beer, dinner, live auction and trivia. Tickets are $30 in advance and $35 the day of event. Doors open at 5:30pm and dinner will be served at 6:30pm. A limited amount of tickets will be available the day of event! Click below for all the details!